The world's best solution for managing your corporate event. GolfDayPro is the world's best solution for managing your corporate golf day. Our online golf event management system has been designed specifically for golf days and is guaranteed to save you time with the planning and running of your golf day. The GolfDayPro system has been designed to take the hassle, effort and mistakes out of the planning of your next golf day whilst at the same time adding fun and memories for all participants. 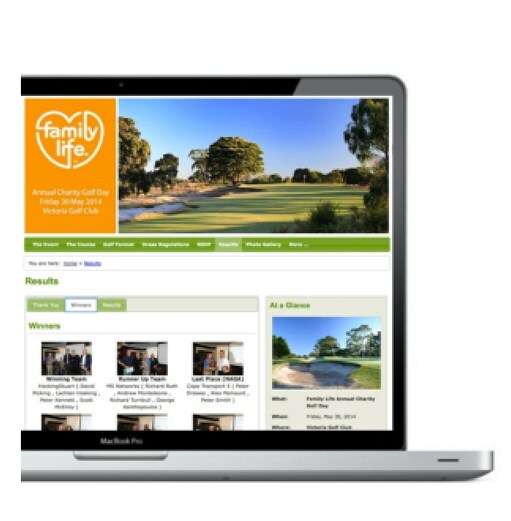 Developed by professional golf day management company GOLFSelect – a leader in the golf event management field for over 15 years, the online system draws upon extensive experience gained from running hundreds of dedicated golf events throughout Australia and New Zealand. Showcase your event via a compelling, branded, fully-responsive website. First impressions count. Impress your clients with a personalized, professionally designed, company branded golf day invitation. Uploading your guest names is a breeze and sending bulk invites out as simple as the push of a button. Watch behind the scenes as client responses are automatically updated in the secure, online database. 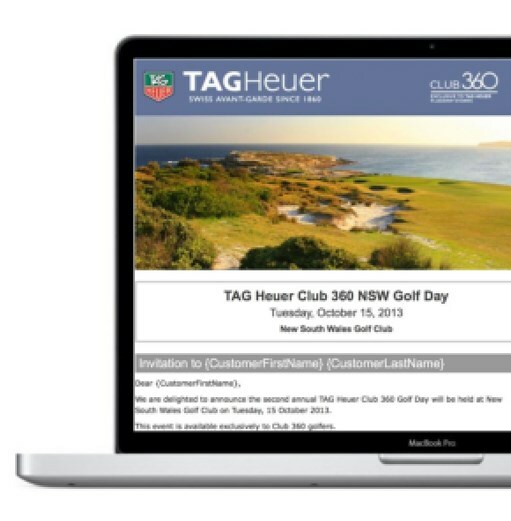 Clients answer your pre-determined RSVP questions and provide you with real time, accurate attendee status for your golf day. Gone are the days of multiple, messy spreadsheets, time consuming manual updating and frustrating telephone follow up. Communication with your clients prior to the day is important. GolfDayPro allows you to confirm all golf day elements with your registered players by way of a pre game email typically sent a few days prior to the event. Attendees can update their requirements online which in turn immediately updates all reports and player information. GolfDayPro comes with an impressive suite of reports – all designed to help you administer the smooth running of the day itself. In addition to group and alphabetical player lists, GolfDayPro also enables the organizer to print out name tags, bag tags, group cards, scorecard stickers and more. Furthermore when changes occur to player attendance (as they invariably do in all golf days) reports are automatically updated negating the need to re-perform messy mail merging. The day itself brings with it many challenges including the efficient registration of all players. In addition to GolfDayPro providing group and player reports which can be used for registration the system offers a powerful, user friendly online registration interface. Players are registered with a simple click of the mouse. On the day grouping changes are easily managed by clicking and dragging players into alternate groups. Name changes, replacement players, handicap adjustments and more are all expected and seamlessly handled through GolfDayPro. Prepare to be stress free at your golf day! Do away with score cards! Golfers like to know how they are going on course. GDPScoreTracker provides this and more through mobile scoring on players own mobile devices. Working across all mobile operating systems and without the need to download or purchase apps, hole scores are entered by players as they make their way around the course. Instant access to real time leaderboards is immediately available. Players can also view hole playing tips, competition holes as well as sponsor logos as they play each hole. For those attendees not playing in the golf day they can view the live leaderboard in the clubhouse on any internet enabled television. Additionally anyone in the world can view the live leaderboard on their mobile phone by browsing to the event website and entering the event code. The day is over but not quite! A post game email can be sent to all players thanking them for attending the day and directing them to a comprehensive post game website. Full playing results, photos from on course and prize presentations are featured and attendees can also post comments about how much fun they had on the day. GolfDayPro is available for your next golf day and can be set up in as little as 10 minutes. Our comprehensive database of all golf courses in Australia and New Zealand as well as many overseas courses means that your golf day will be fully populated with complete information about the golf course. The GolfDayPro system is also extremely well priced with a variety of options available for single and multiple golf days and will save you many hours in the preparation for your golf day. Pricing plans to suit your event, your needs. The perfect choice for when you just need the power of the GolfDayPro mobile scoring application. 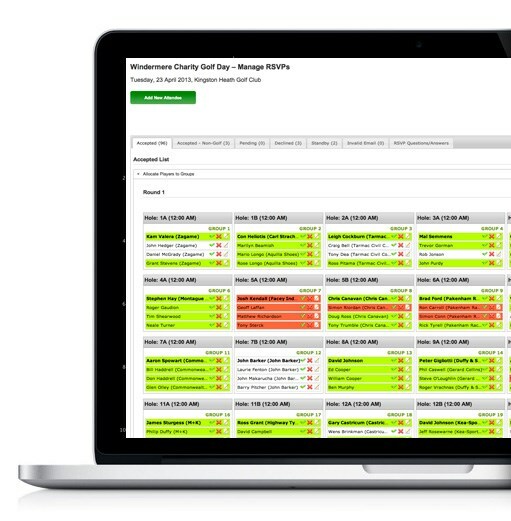 The perfect choice for when you need a powerful golf event management system, but don't need the mobile scoring option. 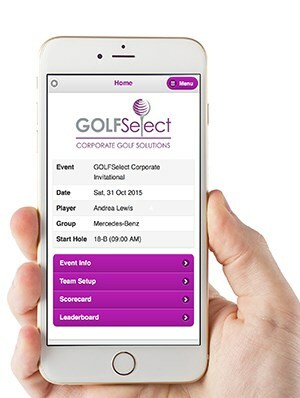 A powerful golf event management system plus the GolfDayPro mobile scoring application. GOLFSelect organises corporate golf events throughout Australia and New Zealand and count amongst our clients many of Australia's largest and most respected companies. We also specialise in organising charity golf events for major Australian charities, such as Ronald McDonald House, Let's Beat Bowel Cancer, and Ardoch Youth Foundation. 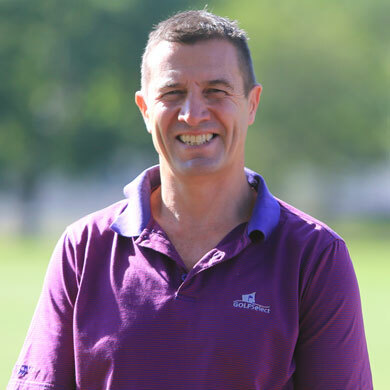 Gary is the owner of GOLFSelect, having started the business 18 years ago after a number of years as a chartered accountant working for a large city firm. A love of golf and strong contacts within the golf industry, combined with increasing requests from friends and clients saw Gary, and his wife Maureen, form GOLFSelect – a business designed to help golfers experience the best golf in the world, wherever that might be with custom, bespoke itineraries. Gary is also a member of the illustrious US Golf Magazine World Top 100 ranking panel – charged with the responsibility of ranking the best golf courses on the planet and having visited and played over 300 golf courses in 15 countries around the world is well placed to advise the ideal golf itinerary. 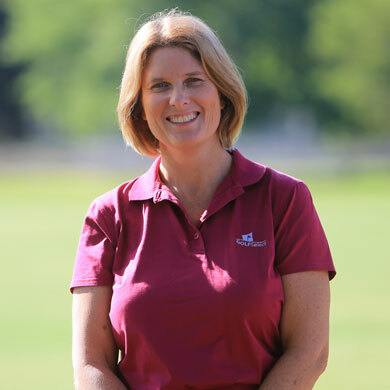 Megan brings a wealth of experience in the golf marketplace with over 20 years in the industry. Megan's extensive resume includes an extended time at a leading corporate golf venue as Corporate Golf Manager, owning and running her own sports consultancy business, working as a PR Director for a leading PR consultancy and in 2001 was involved in the Accenture World Matchplay working to help co-ordinate the very successful caddy program. Megan is responsible for a number of our multi-national golf day clients and also manages the GOLFSelect Business Network – preorganised golf days empowering companies to use golf as a client entertainment tool. Chloe is the newest member to join the GOLFSelect team and brings with her a youthful enthusiasm and a desire to learn as much about golf events as possible. Hailing from Coffs Harbour (home of the famous Big Banana! – as well as the wonderful Bonville International Resort), Chloe has recently moved to Melbourne and is completing a diploma in Events and Tourism. The team is actively lobbying for her to follow their AFL team (Saints, Bombers, Magpies, Tigers) however we feel she will always remain an NRL girl (Roosters). Our Club and Corporate Members have been utilising the Golf Day Pro system over the past 3 years to manage their corporate golf events with us. Each and every time our Members have been delighted with the system and the exceptional customer service and back-end support offered by Gary and his team. We have found that the ease with which the system is able to manage the entire event, from start to finish, has saved our Members hundreds of man-hours and, of course, significant expense. Golf Day Pro really is an event manager’s dream. It removes the headache of managing multiple spreadsheets, instead combining the invitational process, with RSVP management, mobile scoring and it even offers a dedicated event website, complete with personalised corporate logo and post-event photo page for guests to remember the day! As a side-note, the mobile scoring system that Golf Day Pro offers is completely transforming our golf days into modern, corporate golf events that now gives our Club an industry ‘edge’ over our competitors, and we are proud to promote this fabulous system direct to our Corporate Membership base. We see repeated use of the Golf Day Pro by every single Member who has been exposed to it. Never again will they consider managing a corporate golf event without the use of the Golf Day Pro system. The Australian Masters has been an important event in the landscape of Australian tournament golf for over 30 years. 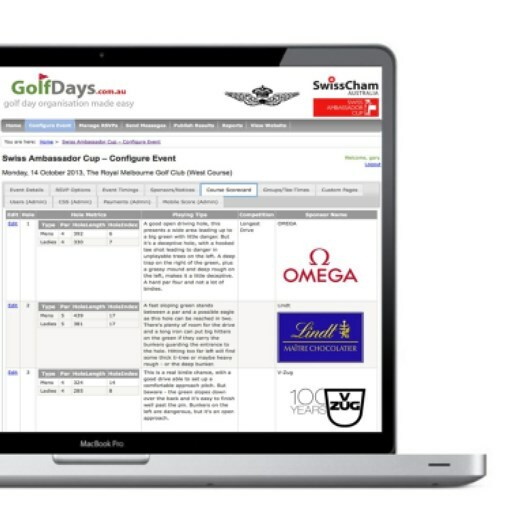 To ensure we offered nothing but the best to our players, spectators and sponsors we utilised the GolfDayPro Event Management system to manage the Pro-Am event for our 2014 and 2015 tournaments. It helped us to facilitate the registration of players for the event as well as provide the latest in mobile scoring and live leaderboard technology. Positive player feedback received confirmed this was the right choice – in short our players loved feeling as though they were part of the tournament with live leaderboards keeping them updated as to how they were faring. The GolfDayPro team were a pleasure to work with and were invaluable both in the lead up to the event and throughout the event. I would highly recommend the GolfDayPro system to any company wanting to lift their golf event to the next level. Hope you are well. I just wanted to provide you with some feedback regarding GolfDayPro. 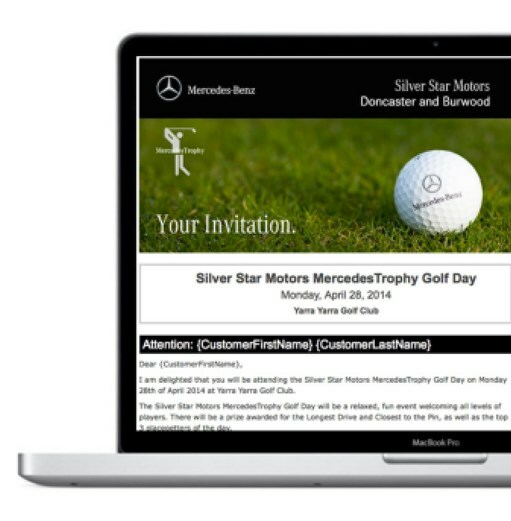 As this is my 4th year with Mercedes-Benz Berwick and being a part of what can be a very tedious process of registering our golfers for the MercedesTrophy event, this system in the last 2 years has made a world of difference! This very user friendly system made the process for myself and organisers very simple from the process of inviting our golfers, to registering them and post event thank you. I just wanted to pass on my thanks and feedback on how great this system is and I would highly recommend it to any golf organiser! Thank again for all your teams assistance throughout the process. GolfDayPro is an absolutely outstanding program. We have now been using the system for four years and I couldn’t see us hosting a golf day without it. The invitation and check-in system is very intuitive, and makes the life of an event organiser so easy! And the feedback from our clients has been great– they love being able to check the leader board while out on the course – it creates much excitement, and a bit of healthy competition. The support we receive from the GofDayPro team has been truly magnificent – nothing is ever too much trouble. We love working with them. We have been running our golf day for a number of years now using the same system of spreadsheets and follow up phone calls. Every year it has been a massive effort, but we took the leap this year and used GOLFSelect’s GolfDayPro. This was the best decision we made. It saved us so much time, and the day flowed beautifully because of it. Leading up to the event I just logged in and saw at a glance who had registered and who needed hire equipment and more – it was so easy. On the day itself, the system provided easy to read reports and the live online registration page was incredibly intuitive. We will definitely be using this again for our next event. The Gary Peer golf day has been running for many years, a day our clients look forward to! Each year months would go into planning, getting invitations out, monitoring RSVP’s and ensuring correct information (handicaps etc) was collated for each player. 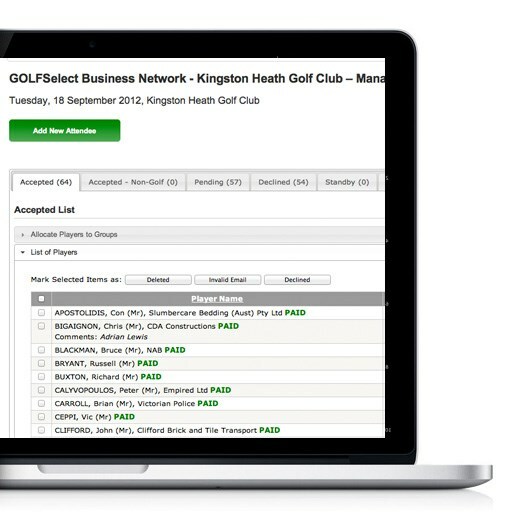 Last year we took the leap and used GOLFSelect’s GolfDayPro… all of a sudden our golf day was organised! Invites out! RSVP coming in and being monitored all with only a few clicks of a button by me. On the day itself it made the day run so smoothly (The GOLFSelect team were AMAZING!) – and the mobile scoring was loved by all that attended! I even think it made the competition more competitive! No Golf Day will ever be run again without GolfDayPro. Just wanted to say a big thank you for all of your help in the lead up to our golf event last Friday. The day was a huge success, we have been receiving some great feedback from our clients. The GolfDayPro system made the registrations process so easy and seamless. Thanks again and we can't wait to use the system again next year. The GolfDayPro system has allowed me to manage our Golf Days in a far more cohesive manner. GolfDayPro has allowed me to be able to access information at a click of a button and in a very professional and presentable manner. The program is just so user friendly and encapsulates everything I need. All attendees were very satisfied with the whole online system and specifically with the mobile scoring, I received such comments as “ Golf is moving with the times” and “how simple it was to use”. I look forward to using the GolfDayPro system again next year along with the friendly and helpful staff at GOLFSelect. Please complete the form below and one of our staff will contact you (via email) within two business days regarding your enquiry. Copyright © 2019 EventDayPro. All Rights Reserved.